Rosary Sunday is THIS Sunday, May 1st at 3:00pm, and you're invited! As always there will be an outdoor procession with the statue of Our Blessed Mother, recitation of the rosary, crowning of Our Lady, preaching, and benediction of the Blessed Sacrament. What better way to begin our Lady's month of May than with Rosary Sunday? Archbishop Bernardito C. Auza will be the guest preacher this year. 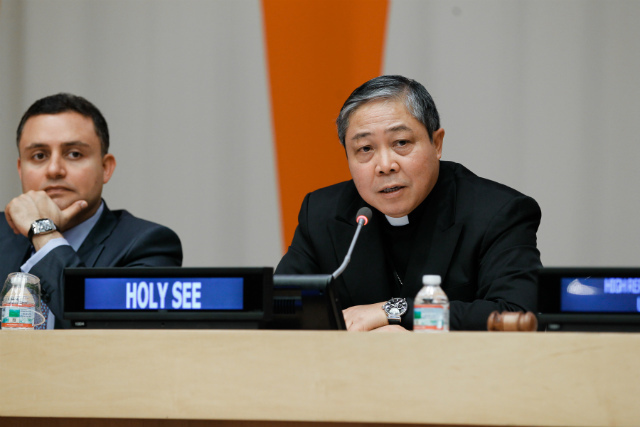 Not only is Archbishop Auza the Permanent Observer of the Holy See to the United Nations, he is also a member of the Priestly Fraternities of St. Dominic! Our Lay Fraternities of St. Dominic Chapter will be providing refreshments downstairs in St. Dominic's hall. Don't forget to stop by the upstairs parlor to say hi to the nuns before you leave!